The Western Press doesn’t have much to say about the military operations in Syria, except to affirm, without the slightest proof, that the Coalition is successfully bombing Daesh jihadists while the Russians continue to kill innocent civilians. It is in fact difficult to form a reasonable idea of the current situation, particularly since each side is readying its weapons in preparation for a wider conflict. Thierry Meyssan describes what is going on. 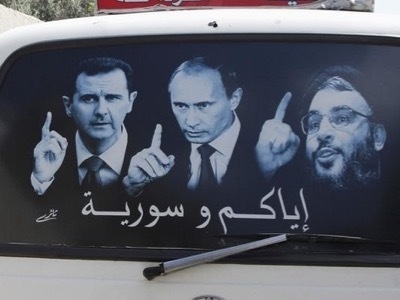 A private Syrian bus decorated with the portraits of Bachar el-Assad, Vladimir Putin and Hassan Nasrallah, the three men who symbolise the Resistance against foreign agression. The silence surrounding the military operations in Iraq and Syria does not mean that the war has ground to a halt, but that the different protagonists are preparing for a new round of hostilities. On the imperial side, there reigns a state of total confusion. With regard to the contradictory declarations by US leaders, it is impossible to understand Washington’s objectives, if indeed there are any. At the very best, it would seem that the United States are allowing France to take certain initiatives at the head of one part of the Coalition, but even there, we do not know their real objectives. Of course, France declares that it wants to destroy Daesh in retaliation for the attacks of the 13th November in Paris, but it was already saying so before these attacks took place. Their earlier declarations were the stuff of public relations, not reality. For example, the Mecid Aslanov, property of Necmettin Bilal Erdoğan’s BMZ Group, left the French port of Fos-sur-Mer on the 9th November 2015, having just delivered, in total impunity, a cargo of oil which it claimed had been extracted in Israël, but which in reality had been stolen by Daesh in Syria. There is nothing to indicate that the situation is any different today, or that we should begin taking the official declarations seriously. French President François Hollande and his Minister of Defence Jean-Yves Le Drian visited the aircraft-carrier Charles-De-Gaulle, off the coast of Syria, on the 4th December. They announced a change of mission, but gave no explanation. As Army Chief of Staff General Pierre de Villiers had previously stated, the ship was diverted to the Persian Gulf. The aeronaval Group constituted around the Charles-De-Gaulle is composed of its on-board aerial Group (eighteenRafale Marine, eight modernised Super Etendard, two Hawkeye, two Dauphin and one Alouette III), the aerial defence frigateChevalier Paul, the anti-submarine frigate La Motte-Picquet, the command flagship Marne, the Belgian frigate Léopold Ier and the German frigate Augsburg, and also, although the Minister of Defence denies it, a nuclear attack submarine. Attached to this group, the stealth light frigate Courbet remained in the western Mediterranean. The European forces have been integrated into Task Force 50 of the USNavCent, in other words the US Central Command fleet. This unit now comprises about sixty ships. The French authorities have announced that rear-admiral René-Jean Crignola has taken command of this international force, without mentioning that he is placed under the authority of the commander of the 5th Fleet, rear-admiral Kevin Donegan, who is himself under the authority of General Lloyd J. Austin III, commander of CentCom. It is in truth an absolute rule of the Empire that the command of operations always falls to US officers, and that the Allies only occupy auxiliary positions. In fact, apart from the relative promotion of the French rear-admiral, we find ourselves in the same position as last February. We have an international Coalition which is supposed to be fighting Daesh, and which – for an entire year – has certainly multiplied its reconnaissance flights and destroyed Chinese oil installations, but without having the slightest effect on its official objective, Daesh. Here too, there is no indication that anything will change. The Coalition has announced that it has carried out new bombing missions and destroyed a number of Daesh installations, but these allegations are unverifiable and even more doubtful insofar as the terrorist organisation has not made the slightest protest. From this disposition, we may conclude that France may elaborate its own strategy, but that the United States can re-assert control at any time. We could deal here with the terrorist organisations, but that would involve pretending, like NATO, that these groups are independent formations which have suddenly materialised from the void, with all their salaries, armement and spare parts. More seriously, the jihadists are in fact mercenaries in the service of Turkey, Saudi Arabia and Qatar – it seems that the United Arab Emirates have almost completely withdrawn from this group – to which we must add certain multinationals like Academi, KKR and Exxon-Mobil. Turkey continues its military deployement in Bachiqa (Irak), in support of the Kurdish forces of illegitimate President Massoud Barzani who, although his mandate is terminated, refuses to leave power and organise new elections. When the Iraqi government demanded that Turkey remove its troops and tanks, Ankara responded that it had sent its soldiers to protect the training forces deployed in Iraq according to an earlier international agreement, and that it had no intention of withdrawing them. It then added even more, bringing the number of troops involved to at least 1,000 soldiers and 25 tanks. Iraq referred its case to the United Nations Security Council and the Arab League, without provoking the slightest reaction anywhere. Turkey and the ex-governor of Mosul, Atheel al-Nujaifi, would like to be present when the city is taken from Daesh, hoping to be able to prevent it from being occupied by the Popular Mobilisation Forces (al-Hashd al-Shaabi), the great majority of whom are Shia. It’s clear that everyone is dreaming – illegitimate President Massoud Barzani believes that no-one will question his annexation of the oil fields of Kirkuk and the Sinjar mountains – the leader of the Syrian Kurds, Saleh Muslim, imagines that he will soon be President of an internationally-recognised pseudo-Kurdistan – and President Recep Tayyip Erdoğan presumes that the Arabs of Mosul long to be liberated and governed by the Turks, as they were under the Ottoman Empire. Furthermore, in Ukraine, Turkey has deployed the International Islamist Brigade that it officially created last August. These jihadists, who were extracted from the Syrian theatre, were divided into two groups as soon as they arrived in Kherson. Most of them went to fight in Donbass with the Cheikh Manour and Djokhar Doudaïev Brigades, while the best elements were infiltrated into Russia in order to sabotage the Crimean economy, where they managed to cut all electricity to the Republic for 48 hours. Saudi Arabia united its mercenaries in Riyadh in order to constitute a delegation in readiness for the next round of negotiations organised by the NATO Director of Political Affairs, US neo-Conservative Jeffrey Feltman. The Saudis did not invite the representatives of Al-Qaïda, nor those of Daesh, but only the Wahhabist groups who are working with them, like Jaysh al-Islam or Ahrar al-Sham. Therefore, in theory, there were no « terrorist groups », as listed by the UNO Security Council, present at the conference. However, in practice, all the participants were fighting with, in the name of, or alongside Al-Qaïda or Daesh without using their label, since most of these groups are directed by personalities who once belonged to Al-Qaïda or Daesh. Thus, Ahrar al-Sham was created just before the beginning of the events in Syria by the Muslim Brotherhood and the principal leaders of Al-Qaïda, drawn from personalities close to Osama bin Laden. Continuing to act as they had before the Russisan intervention, the participants agreed to a « political solution » which would start with the abdication of the democratically-elected President Bachar el-Assad, and continue with a sharing of power between themselves and the Republican institutions. Thus, although they have lost all hope of a military victory, they persist in counting on the surrender of the Syrian Arab Republic. Since the representative of the Syrian Kurds was not invited to the conference, we may conclude that Saudi Arabia considers the project for a pseudo-Kurdistan as distinct from the future of the rest of Syria. Let us note in passing that the YPG has just created a Syrian Democratic Council in order to reinforce the illusion of an alliance between Selah Muslim’s Kurds and the Sunni and Christian Arabs, when in reality, they are fighting each other on the ground. In any case, there is no doubt that Riyadh is supporting Turkey’s efforts to create this pseudo-Kurdistan as a place of banishment for « its » Kurds. Indeed, it is now confirmed that Saudi Arabia supplied the logistical aid necessary for Turkey to guide the air-air missile which shot down the Russian Soukhoï 24. Finally, Qatar is still pretending that it has not been involved in the war since the abdication of Emir Hamad, two years ago. Nonetheless, proof is accumulating of its secret operations, all of which are directed not against Damascus, but against Moscow – thus, the Qatari Minister of Defence, in Ukraine at the end of September, bought a number of sophisticated Pechora-2D anti-air weapons which the jihadists could use to threaten Russian forces. More recently, he organised a false-flag operation against Russia. Still in Ukraine, at the end of October, he bought 2,000 OFAB 250-270 Russian fragmentation bombs and dispersed them on the 6th December over a camp of the Syrian Arab Army, in order to accuse the Russian Army of blundering. In this case too, despite the proof, there was no reaction from the UNO. The Russian forces have been bombing the jihadists since the 30th September. They plan to continue at least until the 6th January. Their action is aimed principally at destroying the bunkers built by these armed groups and the totality of their logistical networks. During this phase, there will be little evolution on the ground other than a withdrawal of jihadists towards Iraq and Turkey. The Syrian Arab Army and its allies are preparing a vast operation for the beginning of 2016. The objective is to provoke an uprising of the populations dominated by the jihadists, and to take almost all the cities in the country simultaneously – with the possible exception of Palmyra – so that the foreign mercenaries will fall back to the desert. Unlike Iraq, where 120,00 Sunnis and Ba’athists joined Daesh only to exact revenge for having been excluded from power by the United States in favour of the Chiites, rare are the Syrians who ever acclaimed the « Caliphate ». On the 21st and 22nd November, in the Mediterranean, the Russian army took part in excercises with its Syrian ally. As a result, the airports of Beirut (Lebanon) and Larnaca (Cyprus) were partially closed. On the 23rd and 24th November, the firing of Russian missiles on Daesh positions within Syria provoked the closing of the airports at Erbil and Sulaymaniyah (Iraq). It seems that in reality, the Russian army may have been testing the possible extension of its weapon that inhibits NATO communications and commands. In any case, on the 8th December, the submarine Rostov-on-Don fired on Daesh installations from the Mediterranean. Russia, which disposes of the air base at Hmeymim (near Lattakia), also uses the air base of the Syrian Arab Army in Damascus, and is said to be building a new base at al-Shayrat (near Homs). Besides this, some high-ranking Russian officers have been carrying out scouting missions with a view to creating a fourth base in the North-East of Syria, in other words, close to both Turkey and Iraq. Finally, an Iranian submarine has arrived off the coast of Tartus. Hezbollah, who demonstrated their capacity to carry out commando operations during their liberation of the Sukhoï pilot held prisoner by militias organised by the Turkish army, are preparing the uprising of Shia populations, while the Syrian Arab Army – which is more than 70% Sunni – is concentrating on the Sunni populations. The Syrian government has concluded an agreement with the jihadists of Homs, who have finally accepted to either join up or leave. The area has been evacuated under the control of the United Nations, so that today, Damascus, Homs, Hama, Lattakia and Der ez-Zor are completely secure. Aleppo, Idlib and Al-Raqqah still need to be liberated. Contrary to peremptory affirmations by the western Press, Russia has no intention of leaving the north of the country to France, Israël and the United Kingdom so that they can create their pseudo-Kurdistan. The patriot plan forsees the liberation of all the inhabited areas of the country, including Rakka, which is the current « capital of the Caliphate ». This is the calm before the storm. Click above logo for original post. International Relations: the Calm Before the Storm?